There’s no denying that mobile devices have fundamentally changed how we interact with technology. With so much information and data at our fingertips, many people keep their phones with them at all times, ready to be used at a second’s notice. In addition to the moments where we are connecting with our friends, family, and colleagues, there are also moments inspired by the need to learn something, go somewhere, do something, or buy something. According to Google, a whopping 91 percent of smartphone users turn to their smartphone for ideas while performing a task, and 82 percent of smartphone users consult their devices when preparing to make a purchase inside a store. In the marketing world, these interactions are known as “micro-moments,” and they’re fundamentally changing how consumers interact with brands and businesses. 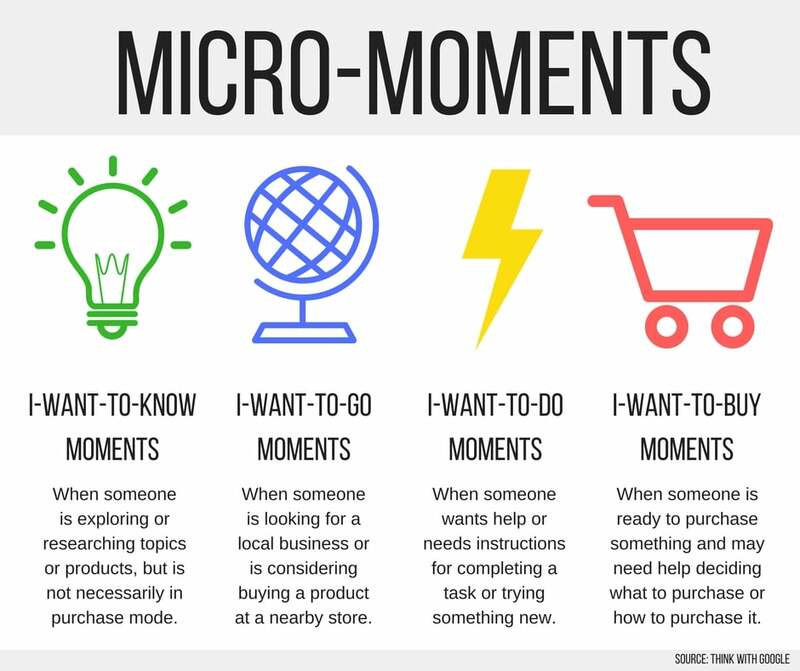 Often, these four types of micro-moments align with the steps that consumers take to ultimately make a purchase. As a result, a single micro-moment may inextricably link to other micro-moments, similar to how a sales cycle works. For example, the simple act of going to see a new movie could involve at least three distinct micro-moments. How? Imagine you just heard about a new film that was recently released in theaters. During an “I-want-to-know” moment, you might do a quick search to learn more about the film or read reviews. If you decide you’re interested in seeing the film, you’ll then want to find out if the film is playing at any nearby theaters and compare showtimes — searching for a local business would be an “I-want-to-go” moment. Lastly, if you decide to purchase your tickets online directly from the theater or a third party service, that would be an “I-want-to-buy” moment. Altogether, these micro-moments represent consumer decisions — the decision to see the movie, the decision to choose a particular movie theatre, the decision to purchase tickets online rather than in-person. The bottom line is that how your business or brand represents itself online plays a major role in how you’re reaching your target audience as they experience these micro-moments. When consumers turn to their device to answer their questions, you need to be ready to meet those needs. How should businesses respond to micro-moments? Since micro-moments play a significant role in shaping consumer decisions through search queries, it’s imperative that business owners tailor their SEO strategy accordingly. To do this, you need to anticipate the needs of your target audience and be prepared to offer a helpful experience that meets those needs. Since the rise of micro-moments is the direct result of an increase in mobile users, the most basic thing your business can do to appeal to this new trend in marketing is to make sure you properly optimize your online presence for these users. This means your site should load quickly, have a responsive design, and be accessible. If your site is lacking in any of these qualities, search engines like Google will penalize your business with poor rankings. Anticipating the needs of your consumers means you have to consider what kind of questions and concerns they may have about the product or service your offer. For consumers with “I-want-to-know” and “I-want-to-do” queries about your product or services, consider offering helpful resources and content. This could be as simple as an FAQ page on your site or an exhaustive collection of “how-to” videos on your company’s YouTube channel. The most common micro-moments that businesses appear in involve users trying to find the business’ location or contact information. Google makes improving your local findability a simple task with their Google My Business platform, which allows businesses to manage and customize the listing that shows up when users search for a business or relevant keywords pertaining to a business. Google automatically creates your listing, which business owners can then claim through a special verification process. Once you have access to your Google My Business account, you can control all the information and imagery related to your business, including your business description, address, hours of operation, website, contact information, and more. In addition to providing up-to-date location and contact information to your customers, claiming your listing also makes your business eligible to receive and respond to customer reviews. Keeping up with and adapting to internet trends can be a challenge, but by implementing these micro-moment marketing efforts, you can help your business more easily anticipate and meet the needs of your target consumers.